WATCH: Arlie Shaban attempts to slay the Dutch lion aka Lex Veldhuis in a heads-up battle on PokerStars. While Greek god Hercules had to slay the Nemean lion and bring back his skin as part of his 12 labours, Arlie Shaban, in the first of his '12 Labours of Arlie,' had to slay another brand of beast. Like the lion, Shaban's beast was great, regal, and fearless. Shaban's beast was from "Dutchland"... also known as the Netherlands. That's right, Shaban was tasked with taking down Lex Veldhuis in a heads-up match on the virtual poker battlefield. Veldhuis was waiting for Shaban, and would not go down without a fight. Watch the following clip for some highlights of the great battle that ensued, and find out if and how Shaban was able to overcome his beast and don the golden skin of his opponent. 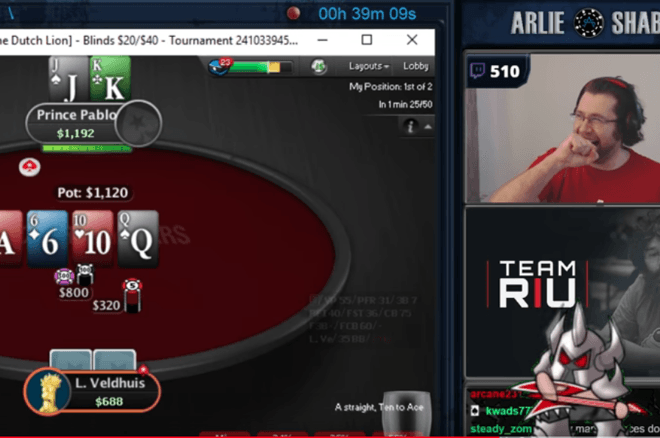 During the battle, Veldhuis alluded to another clash he had just engaged in, which was his journey through the WCOOP $25,000 High Roller that he played on PokerStars as a reward to his loyal subscribers. Veldhuis showed he was not afraid of the absurdly high-level competition, firing two bullets to try to run up a stack. He failed to get traction though, perhaps flying a bit too close to the sun, but fans can be assured: they haven't seen the last of their brave Dutch warrior. Keep following PokerNews for more updates on Shaban's epic mission sent from the poker gods.